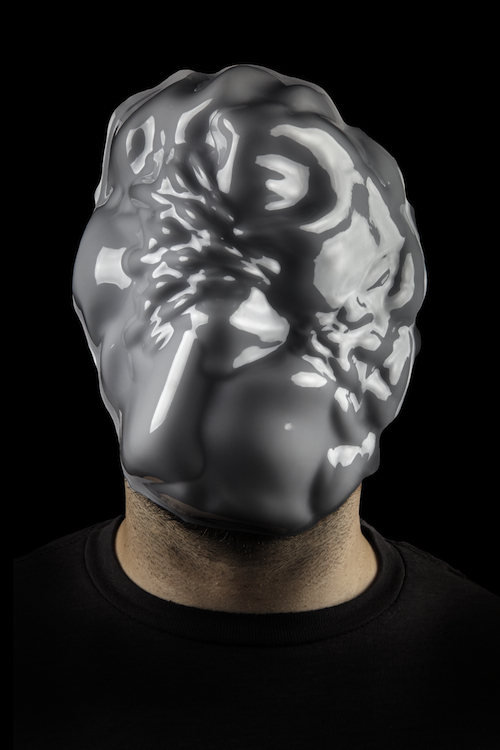 Zach Blas, Facial Weaponization Suite: Mask, May 19, 2014, photograph of plastic mask, dimensions variable. “Teoría del color” (Color Theory) investigates social systems steeped in exclusion, racial differentiation, and discrimination, through the work of fifteen international artists in a variety of media, including posters, video, installation, photography, painting, and performance. These works reveal that there is no better testament to the racism deeply rooted in our time than the visual clues embedded in supposedly postracial societies. Take for example Daniela Ortiz’s 97 Empleadas domésticas (97 Domestic Employees) , 2010, a compelling photo album of snapshots documenting social and family gatherings of upper-class Peruvians collected by the artist from Facebook profiles. These familiar scenes expose a common yet perturbing practice of exclusion, as in all the photographs, housekeepers and nannies appear either in the background, out of focus, or cropped. While revealing a classist society, these images also expose the ambiguous, awkward conditions of domestic labor where intimacy paradoxically coexists with intentional distancing and estrangement. Everyday and everywhere people are subject to racial differentiation and classification due to the omnipresence of biometric surveillance software. Zach Blas’s “Facial Weaponization Suite,” 2011–14, responds to these technologies by producing a series of masks modeled on aggregated facial data from a workshop’s participants. Creating the possibility to avoid facial identification through amorphous, colorful masks, Blas protests the digital systems that use categorizations based on gender, ethnicity, and sexuality to discriminately privilege and disadvantage people. Racism still exacts heavy socioeconomic, political, and emotional consequences globally, and this exhibition engages these issues in a critical discussion that is very necessary, not least for a country such as Mexico, which is characterized by both invisible and institutionalized mechanisms of discrimination that create destructive social inequality.